Greetings cardfighters! 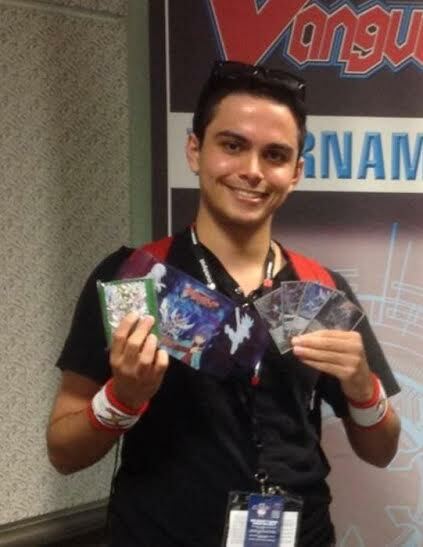 With the national tournament of the ARGCS closing up, there is more time for me to start reviewing cards again. The full card list for the fourth G set: Soul Strike Against the Supreme has been revealed, so now I can adequately review this set. It's English date of release is scheduled to be on October 2nd, which is about one month away. So let's dive right to it! [AUTO](VC) Generation Break 2 (This ability is active if you have two or more face up G units in total on your (VC) or G zone):[Counter Blast (1) & Choose a face down card named "Chronodragon Nextage" from your G zone, turn it face up, choose three cards from your hand, and discard them] At the end of the battle that this unit attacked a vanguard, if you have a heart card with "Chronojet Dragon" in its card name, you may pay the cost. If you do, put this unit into your G zone face up, choose one of your vanguards, and [Stand] it. We start right off the bat with the front runner of this set and it's a very powerful one. Going off its skill alone, Nextage is one of the most powerful re-standing vanguards printed to date for several reasons. It is only CB1, you get five drive checks in total, and the 2nd attack from Chronojet Dragon has the GB2 skill active to disallow your opponent from using Grade 1 or higher units to guard (so no perfect guards here). In this sense, it mixes re-standing and guard restricting into one card! To add icing to the cake, you also still eliminate a unit on the opponent's board because to Chronojet Dragon's stride skill. Some can make an argument that Chronojet's second attack is quite weak in comparison to the first one, but there are several ways to combo or go around this. For one, you can leave your booster standing when Nextage attacks, since 26k with three drive checks is quite adequate in terms of pressure. Summit Crest Gear Wolf is a great option, since it will be a 10k booster thanks to Chronojet's stride skill, which provides us with a 26k attack that disallows perfect guards. You're also more than capable of putting trigger powers on a booster that is standing. It sounds like a normally odd play but its very significant since Chronojet's guard restricting skill is very relevant to knock out additional shields in your opponent's hand. There is also the critical trigger Heart Thump Worker that gives your vanguard 5k power and a draw to evenly exchange for card advantage. While these various combos would seem situational in theory, don't forget that Interdimensional Dragon, Faterider Dragon is an excellent first stride for the clan that you can use to set combos up (especially works great with Gear Wolf), assuming we are not playing against a retire clan. Lastly, lets not forget that Steam Knight, Puzur-Lli and Steam Maiden, Ishin are cards, and having five chances to pass trigger effects to them is really good. The other big question is asking if this card is strong enough to bring Gear Chronicle up to the top tiers. The clan only saw some success soon after G-BT01: Generation Stride came out but they quickly went to the sidelines as other clans obtained their stride support. The deck still suffers from having a weak early game and didn't have strong enough end game power to justify the means in comparison to other top tier clans. The new Steam Knight, Kalium does try to solve this problem by giving Gear Chronicle a solid Grade 2 that is not restricted to Generation Break. Whether this card can fit in Gear Chronicle decks is currently debatable, but it does help them in the early game and eliminating starting vanguards for free. All in all, if I could give my prediction, I would say that Nextage is strong enough to push Gears up to top tier, or at least to the top of the tier 1.5 clans we have right now. [AUTO]:[Choose a face down card named "Soaring Divine Knight, Altmile" from your G zone, and turn it face up] When this unit is placed on (VC), you may pay the cost. If you do, until end of turn, this unit gets "[CONT](VC):All of your units in your front row get [Power]+3000.". Then, if the number of face up cards in your G zone is two or more, search your deck for up to one grade 2 card, call it to (RC), shuffle your deck, and that unit gets [Power]+5000 until end of turn. The new Altmile is far more tricky to review than Nextage is because it is not as straight forward and we have to discuss the various circumstances on what makes this card good (because it is). I'm not going to into all the specific plays since that would take pages for me to discuss all the different combos Royal Paladins can do with Knight of Twin Sword shenanigans and such. 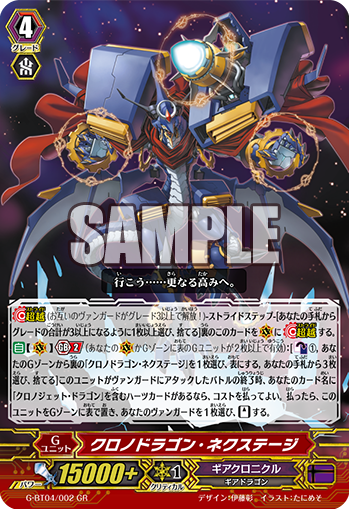 In a nutshell though, Soaring Divine Knight, Altmile is an decent card for most Royal Paladin decks since it is a stride unit that is able to guarantee superior calls from the deck. As of the past few sets, Royal Paladin builds have been entirely dependent on rear-guard skills to superior call from the deck such as Jewel Knight Swordmy, Starlight Violinist, and Knight of Twin Sword, whereas Sanctuary Guard Regalie and Saint Blow Dragon has delivered most of the offensive pressure, albeit without superior call power. The new Altmile is a solid 2-of in those builds to grant you access to on-demand superior calls should you need it, because calling something like Knight of Twin Sword or Jewel Knight, Swordmy into a booster for free is pretty good. Now where the card really shines is of course in the Blue Sky Knight, Altmile deck. 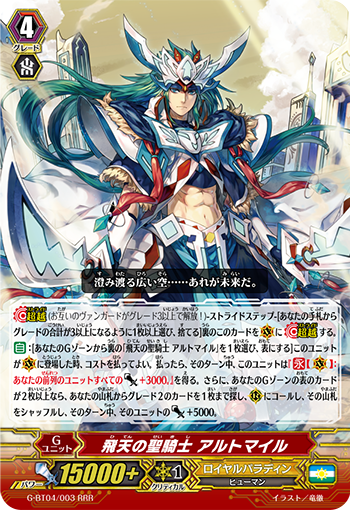 By itself, +3k to one column, and +8k to another with a superior call sounds pretty okay, but when you can mix it with Blue Sky Knight, Altmile's stride skill, it suddenly becomes an extra stage of pressure and you can divide the power boosts in many different ways. In conjunction, you have 15k in extra power you can split between cards of your choosing along with the passive 3k power that lasts for the turn. The new Knight of Reform, Piers is also great for this since you can build additional stages of power for every Grade 2 you play this turn, along with making specific 26k+ columns. Since Soaring Divine Knight, Altmile is an on-stride skill, you can call the card before using Blue Sky Knight, Altmile's stride skill too. All together this is a lot of power ramping! The problem the Altmile deck had before was that oftentimes the deck could not afford to use Altmile's stride skill since it needed counterblasts for other matters (usually conserving them for Thing Saver). Since Soaring Divine Knight, Altmile is completely free, this opens up a lot of room for the deck to use Blue Sky Knight, Altmile's skill. Sure Saint Blow Dragon is also free and its what the deck used before, but it also was not a strong enough boss to make the Altmile stride game good enough in my opinion, since it usually got perfect guarded and you had nothing to show for it. Now the big question is if this deck will be overall better than the currently popular Sanctuary Guard deck for Royal Paladin. My first reaction is probably not. As much as I love Blue Sky Knight, Altmile and it looks far more entertaining to pilot than Sanctuary Guard is, the latter just seems to do what this card does without the combo reliance, with faster speed, and with more simplicity. The Sanctuary Guard deck gets really strong support this set as well. Jumpgal is an incredible starter for the deck that allows them to obtain +12k power to the front row on first stride. Archer of Sanctuary gives the deck a more expensive version of Jewel Knight, Swordmy. On the upside, it is an 11k attacker and it can grab any Grade 1 instead of vanilla Jewel Knight units. Battle Song Angel is a great target for it, since it acts as a 9k booster/attacker with resist! All of this said, the Altmile deck does have some advantages over Sanctuary Guard. For one, the deck is not completely dependent on rear-guards calling rear-guards. One of the Sanctuary Guard deck's weaknesses is dealing with mass retires and simply not having the cards needed to refill their board in hand. Sure like I said earlier, the deck can then go into Soaring Divine Knight, Altmile to call cards from the deck, but it is far less powerful on its own without a stride break skill, and it deviates from what Sanctuary Guard ideally wants to do (spam Regalie). The other strength Blue Sky Knight, Altmile has is a good Generation Break 2 in case you cannot stride. A weakness Sanctuary Guard has is you must stride every turn because Sanctuary Guard Dragon and Sanctuary Guard Guarantee are far too weak by themselves, whereas Blue Sky Knight, Altmile does not suffer from that. All this together, the Altmile deck still gives comparable power to what Regalie provides the Sanctuary Guard build, so it remains to be seen on which build comes out on top! So that concludes this week! Next week I'll be delving more into other cards from this set. Until next time, Play Hard or Go Home!